Inmates Find Expression Through Songwriting - Integration Through Media ....! 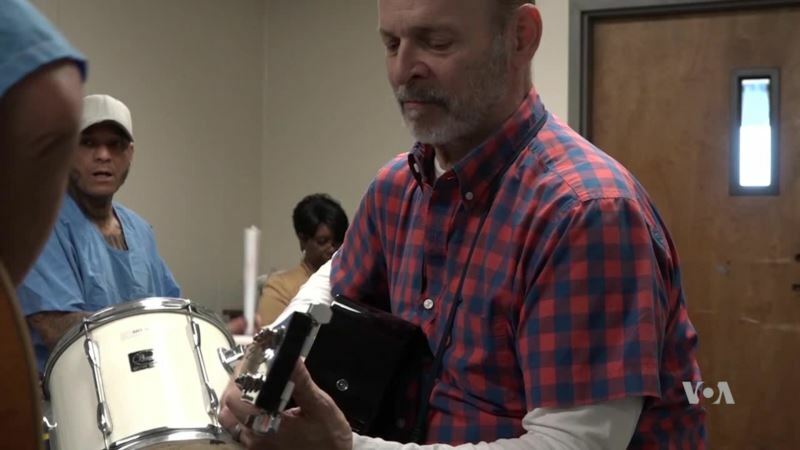 (VOA): Two dozen prisoners gather for a weekly jam session, sponsored by the non-profit group Jail Guitar Doors, at the California Rehabilitation Center, a medium-security state prison in the city of Norco, east of Los Angeles. They do not talk about the crimes that brought them here. They have come to make music. Spanish-speaking inmates compose a ballad on acoustic guitars, while on the other side of the makeshift rehearsal hall, prisoners who have worked as professional musicians play improvised jazz with electric instruments and drums. A larger group of inmates sits in a circle to compose a song that blends blues and rap. “We have a guy that's writing it," explains inmate Osmar Castro. “Another one is doing the beat. Another guy is playing the guitar,” he explained, as the prisoners engage in a two-hour collaboration. With black, white and Latino inmates, it’s a rare collaboration in a prison population that is split along often-hostile racial lines. This music program “tears down” walls, says Montrell Harrell, an African American who is working with other inmates on the new song with the chorus “ain’t gonna hold me back.” “It brings you back to what you were before you came to prison, to not have that race card,” he says. Life in prison is “unambiguously negative,” says Wayne Kramer, a musician who rose to fame in the 1960s as a guitarist with the Detroit-based group MC5. Kramer knows about prisons. The former rocker was incarcerated for two years in the 1970s on a drug charge, and found refuge in music. He later created Jail Guitar Doors USA with his wife, Margaret Saadi Kramer, and British singer Billy Bragg. Bragg had already started a British version of the music charity, inspired by Kramer’s story as told in “Jail Guitar Doors,” a 1978 song by The Clash. These weekly sessions take place in more than 100 prisons across the United States, and Kramer says they give inmates have a chance “to be regular guys, and guys that love doing music together.” The programs have also started in several women’s prisons. For inmate Raymond Malachi Embry, an accomplished drummer, the program is a godsend, offering a place “where musicians such as myself can come in and we can express ourselves, not in a what-we-used-to-be way, but what we have become and who we are now.” Says cofounder Wayne Kramer, “Art is the most powerful thing that I know of to combat the negative effects of life in one of these penitentiaries,” where he says even the institutional architecture is dehumanizing. The rules for songwriting sessions are simple, Kramer explains. “No talk of gang affiliations or ethnic divisions, no racist of sexist humor. We have to treat each other with dignity and respect,” and, engaged in a common project, make music together.